The Holidays are Coming to the Studio…. I have always loved the holidays. Ever since I was little, this time of year never fails to fill me with excitement and joy. When my kids were younger, it was just mostly me and my husband doing the massive holiday decorating and while it was a huge task, I loved every moment. Now, my kids are older, and we all participate in “dressing up the house” for the holidays. I love that both my kids get excited when they see furniture being rearranged and spaces being made for the Christmas trees. My daughter was jumping up and down after ballet class ( her classes are all bar work right now so she is not real excited after class) yesterday as she knew we would be putting up the Christmas trees that evening. It makes me feel blessed that I could help to pass on the joy and excitement of the season to my kids. The next three weeks will be filled with decorating for the holidays at Casa Berry. This activity culminates in a holiday tea that my friends and I hold for a group of about 60 ladies. A big part of the tea is a tour of the doll room and all the lovely stories and conversations that this room inspires. 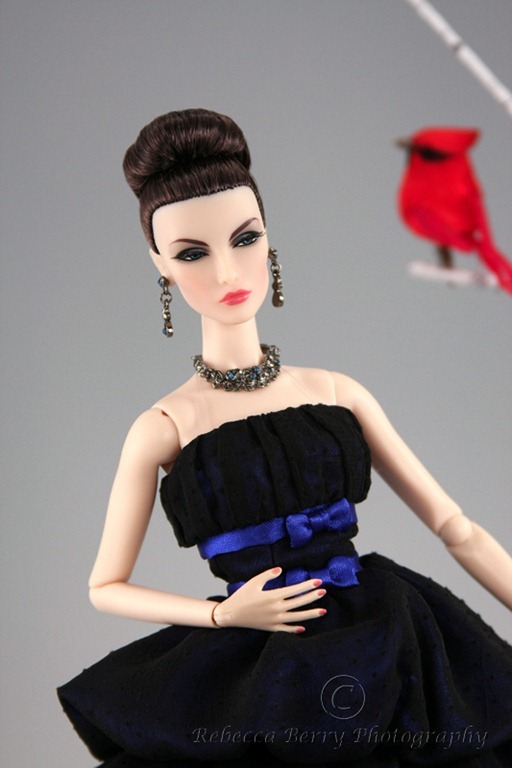 Most every person has a Barbie story or experience to share. There are usually fashion things to discuss as well and the “ If I were going out, I would wear that.” conversations. I will be sharing photos of the doll room as it gets dressed up for the holidays and will share a few photos of the holiday tea as well. For now, I will share the first few photos of holiday inspired themes. I love this Elise! She has a softer color palette than previous Elise’s. I also really love the direction Integrity Toys and their designers are taking in jewelry design. The necklace and earrings that came with this lady are fabulous. This entry was posted on November 9, 2011 by raberry65. 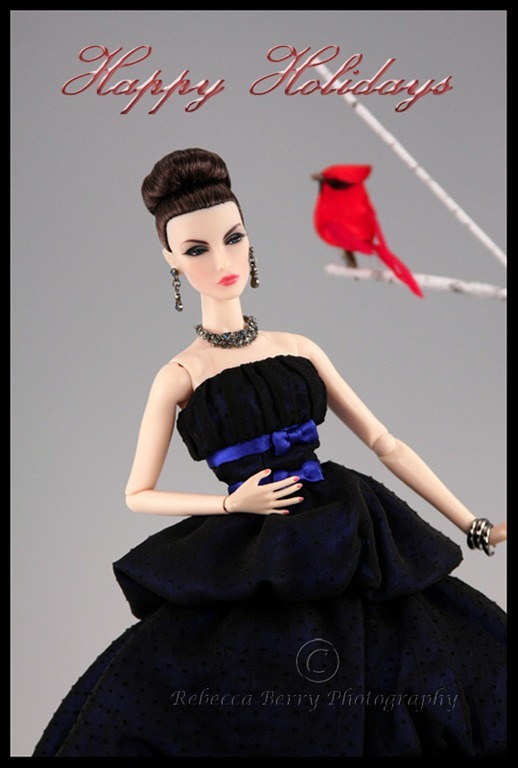 It was filed under Elise Jolie, Fashion Royalty, FR2 and was tagged with Doll Diorama, Doll Photography, Fashion Royalty, FR2, Most Wanted Elise. Merry Christmas and Happy Holidays to you and yours! 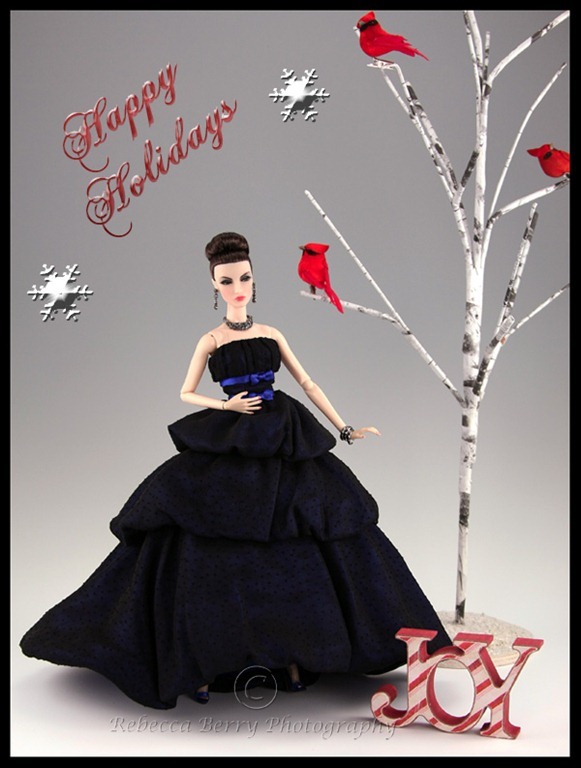 Thanks for sharing your fabulouse photos and dolls! Thank you so much Judy! Same to you and yours. Hugs right back to you my friend! I so wish I were there to help decorate! I love decorating for Christmas. I think it must be because we are December babies, Rebecca. The photos of Elise with the cardinal are so darling. I love them! Can’t wait to see the rest of the house. I sooooo wish you were here too my friend. I am eyeball deep in boxes and will be decorating a 15 foot Christmas tree this weekend. I only have a 12 foot tree to do tonight LOL! Thank you for the compliment on Elise’s photos. Love those cardinals…pun intended as Jon is from St. Louis and they won the World Series this year. Love this post/ pic and LOVE the holidays! I broke our usual tradition and started playing holiday music before Thanksgiving. Stan is tolerating it so far! Can’t wait to see your transformation chez Berry! Thank you Peter! I am starting with the Christmas tunes early as well and it sounds like both of us have partners that will allow us our indulgences LOL! My husband tolerates it as well…as he rolls his eyes ( in a nice way of course). Hope to share some photos soon of the holiday decorating chaos. So glad you liked it dear Matty! Thank you.